AUSTIN, Texas, December 14, 2011 (ENS) – LS Power and its subsidiary, Sandy Creek Energy Associates, have agreed to settle a lawsuit brought by environmentalists that will result in reduced emissions from a new coal-fired power plant in Texas and no Longleaf coal power plant in Georgia. Sierra Club, Public Citizen, and Sandy Creek Energy Associates Monday filed a consent decree with the U.S. District Court in Austin settling legal challenges to the Sandy Creek Energy Station near Riesel, Texas. Based in Houston, Texas, Sandy Creek Energy Associates operates as subsidiary of LS Power Development, LLC, which is headquartered in New Jersey. Although the U.S. Court of Appeals had previously ruled in favor of Sierra Club’s and Public Citizen’s lawsuit against this proposed plant for Clean Air Act violations, construction of the plant was well under way. 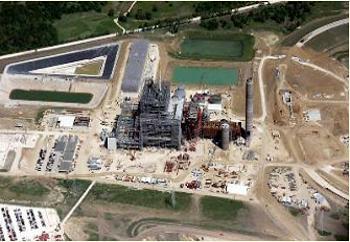 Today, construction of the Sandy Creek Energy Station is nearly complete. The consent decree requires Sandy Creek to reduce its emissions of toxic mercury and particle pollution from this plant and make clean energy investments in the local community. The clean energy investments required by this settlement include a proposed solar panel installation at a nearby school. Within 60 days of the entry of this Consent Decree, Sandy Creek must pay $400,000 to Hallsburg Independent School District to support the installation of rooftop solar panels at the elementary school in Hallsburg, Texas. “This is a great settlement for our community and our schools,” said Robert Cervenka, co-chair of the local organization Texans Protecting Our Water Environment and Resources. A side agreement that has not been made public requires LS Power to withdraw all requests for power plant permits in Georgia and Arkansas, and that any issued permits be rescinded or revoked. This side agreement ends a 10-year battle over whether or not LS Power should be allowed to build the Longleaf Energy Station, a coal-fired power plant scheduled for construction in Blakley, southwest Georgia. Sierra Club, Friends of the Chattahoochee and GreenLaw have been campaigning against the Longleaf coal plant since it was first proposed in 2001. The environmental groups say the defeat of Longleaf has prevented millions of tons of air pollution from entering the atmosphere. Sierra Club is counting this agreement as a victory, saying it marks the 160th proposed coal plant canceled since Sierra Club launched its Beyond Coal campaign in 2005.